Finding a dealership in the Thornhill area that has a large selection of quality Audi vehicles is easy when you choose Pfaff Audi Vaughan. Our dealership is home to new and pre-owned Audi vehicles that our customers can get behind the wheel of. Whether you are looking for an SUV, sedan, coupe, sportscar, or convertible, Pfaff Audi Vaughan has got the selection that you are looking for. Our dealership in Thornhill does not only have a massive selection of premium driving machines, we also have a world class service and parts department, a Certified Collision Repair Facility, Audi Sport Division, and much more. 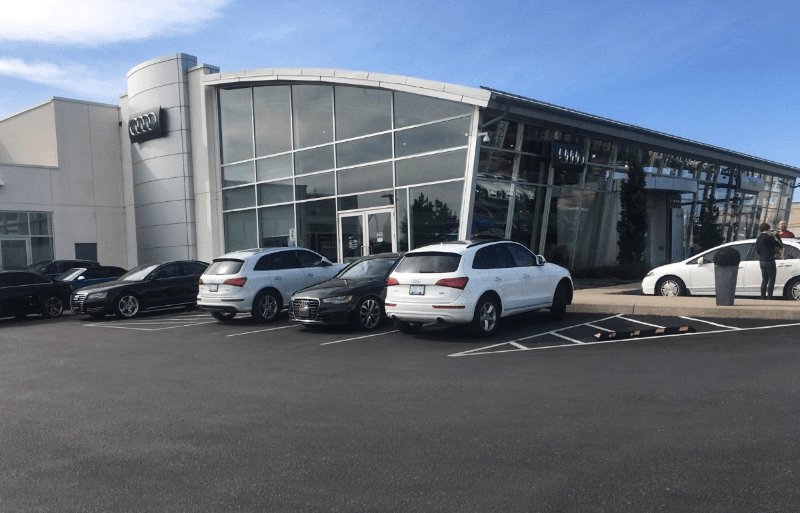 Our dealership is the full package, and when you purchase an Audi vehicle from us, you can take advantage of all of our services! Read on for more information about our dealership in Thornhill. At Pfaff Audi Vaughan, we know your time is valuable. Which is why, when you make an appointment, our representatives will check whether the work involved can be completed using our new Express Service. Your appointment can be made on short notice. While you wait, your Service Advisor will invite you to relax in our lounge while our Audi Certified Technicians work on your vehicle. Enjoy a beverage, surf the Internet, read the newspaper, or watch TV. And if you’re interested in one of the latest Audi models, you can tour the showroom or take a test drive during your visit. Our Express Service is just another way that our dealership can serve our customers better. At Pfaff, we have a 50-plus year history of performance on the racetrack. Our commitment to performance extends beyond selling and servicing the best drivers’ cars in the industry; we also provide you with more ways to experience them than any other dealer. That includes racing our new RS3 LMS in the Continental Tire Challenge around North America. Audi is a heavy hitter and a very respected name within the high performance vehicle industry. Come into our dealership today and test drive an Audi sports car, you will find out what it's like to have an exhilarating driving experience. Pfaff Autoworks is a VeriFacts-certified collision repair centre. VeriFacts, the only independent third-party verifier of excellence in collision repair, only endorses collision repair facilities that have proven and maintain a high level of quality. Independence means that no amount of money can buy an endorsement. VeriFacts-certified collision repair facilities ensure that customers have their vehicle repaired safely, quickly, and economically. Pfaff Autoworks, and our team of professionals, are capable of repairing all types of vehicles. For more information about the services and vehicles offered at our dealership in the Thornhill area, please feel free to continue browsing through our Pfaff Audi Vaughan website. Click here to find our contact numbers and to fill out our contact form.